It’s that time again! The Shopbop Friends & Family Sale is back and better than ever. Take 25% off your ENTIRE purchase for the next three days! 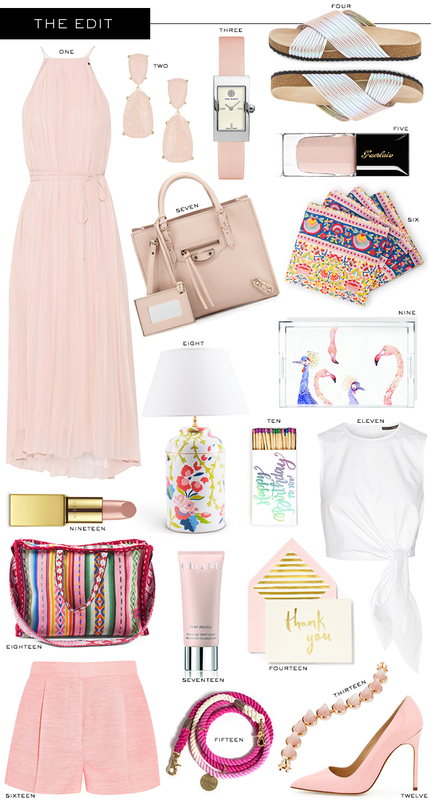 I’ve compiled a list of pieces you need to know about from the sale below – what are you going to get?! This off-the-shoulder Tibi dress. Just because. A cute pair of summer sneakers for pairing with simple striped dresses like this one. Both under $65! Some dainty gold rings like this one and this one. A beautiful neutral tote to take you all the way through September. Aquazzura pumps. And these pale pink sandals. This perfectly perfect IRO jacket. Gimme! My current favorite pair of sunnies. This adorable Mara Hoffman bikini, or this maillot if you can pull off the one-piece look! This hilarious little makeup/toiletry bag or clutch – I want to give this to all my girlfriends! And finally, this number (or this one!) for upcoming spring/summer weddings! Don’t miss out on your favorites – click here to shop now! Designer exclusions apply – visit Shopbop.com for details. great picks and so excited about this sale. blush love:) That dress is so gorg! I hope you enjoy exploring in Georgia, and best of luck to Ben. So much pink goodness, love! I LOVE today’s roundup! Have fun in ATL, you’ll probably love the Buckhead and Dunwoody area! That blush gown is absolutely stunning. I’m loving the pumps and the shorts. The lamp is adorable too! I’m loving how pretty all of these picks are! I’m a complete sucker for cute match boxes. Love those blush pink heels. Have so much fun! I’ve been to the U.S. Open a few times with my dad, I love the excitement at golf tournaments. Great picks! I’ve been eyeing those Aquazzura pumps, so I definitely need to order while they are on major sale! Really great picks, M! Enjoy the Masters – it truly is a tradition unlike any other. Obsessed with that floral lamp and those pretty pink shorts! I never thought I needed a bird-print tray, but I do. Oh, how I do! I want so many things!!!!! Love those pink shorts, lovely round-up Merritt! I always enjoy your selections and how you present them! Love that pretty dress, pink shorts, and patterned napkins. Have fun at the Masters! Love these shades of blush! That dress is so elegant. Perfect for a beach wedding! I.want.everything!! Have a wonderful time in Atlanta. Can wait to see pics!